The Itzy Ritzy Snack Happens Reusable Snack and Everything Bag is a stylish, eco-friendly zippered carrier ideal for toting snacks and other small belongings when you leave the house. The reusable, machine washable bags are perfect for sandwiches, fruit, crackers and so much more. Made with a food safe, FDA approved, BPA-free lining, the Snack Happens bags are also lead free, phthalate free, PVC free and CPSIA certified. Not just for food, the bags are great for stashing electronics, keys, makeup, toiletries and endless other possibilities. The zipper top allows for silent snacking and is ideal for little hands. The 7-inch by 7-inch reusable bags are a wonderful, green alternative to plastic baggies for your lunch, snacks, school, work, litter free lunch programs and they help reduce the huge amounts of plastic bags going into the trash each day. The Snack Happens Snack Bag is machine washable and line drying is recommended for easy cleaning. Reusable, machine washable bags for snacks, sandwiches, fruit, school lunches, electronics, makeup toiletries and much more while on the go. FDA approved food safe, BPA free, lead free, phthlalate and PVC free. 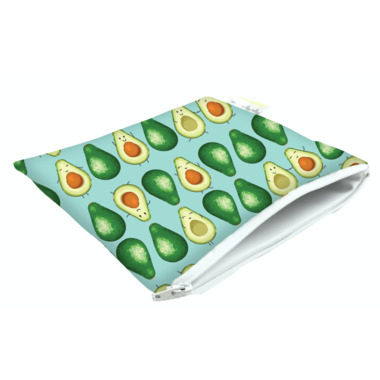 Measures 7-inches by 7-inches with a zipper closure for silent snacking.